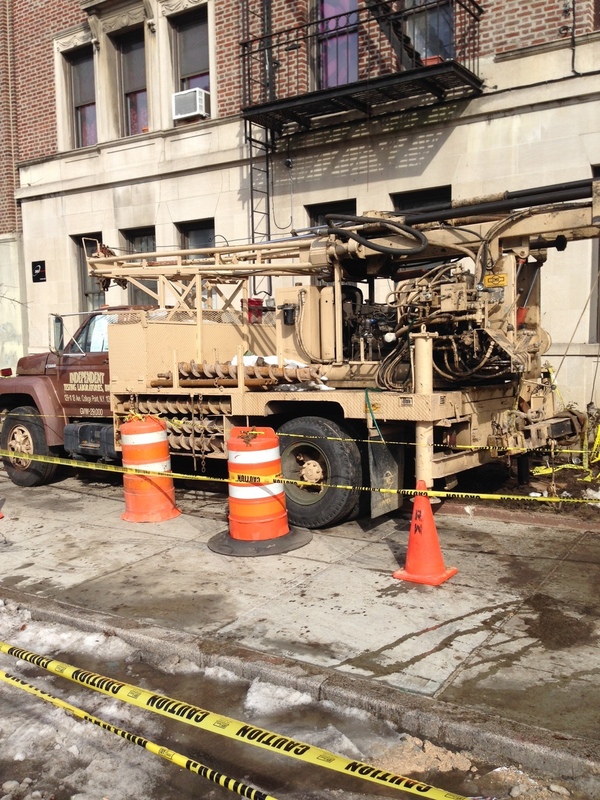 Construction — 85 Eastern Parkway Tenants Association Inc.
As many of you know, the owner of 85 Eastern Parkway, Mr. Mordechai Nagel, has engaged in a long-running attempt to subdivide rent-stabilized apartments in the building, expecting to then rent them out at market value. You also know that the 85 Eastern Parkway Tenants Association has opposed these plans as illegal under current city and state regulations. So, the owner can continue to dump money into this project and continue to apply to the DOB to raise the objections (or start completely new ones), but at this point, it is virtually impossible that he will succeed. for their involvement in all this. Without their participation and support, and the truly extraordinary efforts of their staff, this initial success in defending rent stabilization would not have been possible. And make no mistake: this is all about rent stabilization. Though this particular battle was fought at the DOB level, it was only through necessity. The goal of the owner .. and many other owners .. is to find ways to subvert the letter and intent of the rent stabilization laws of New York City and State. Far bigger legal and regulatory issues are involved, and need addressing. The first and foremost duty of the 85 EPTA is to protect the welfare of the residents of the building. As such, we stood firmly with the above-mentioned officials at the first line of defense: the obvious violations of DOB codes and procedures. There are, however, far deeper and far more important principles involved here, issues that go to the core of the entire rent-stabilization structure. Though we are happy with the DOB’s recent ruling, we stand ready to support the elected officials who represent us in finding more permanent rulings to prevent this sort of thing from happening again. 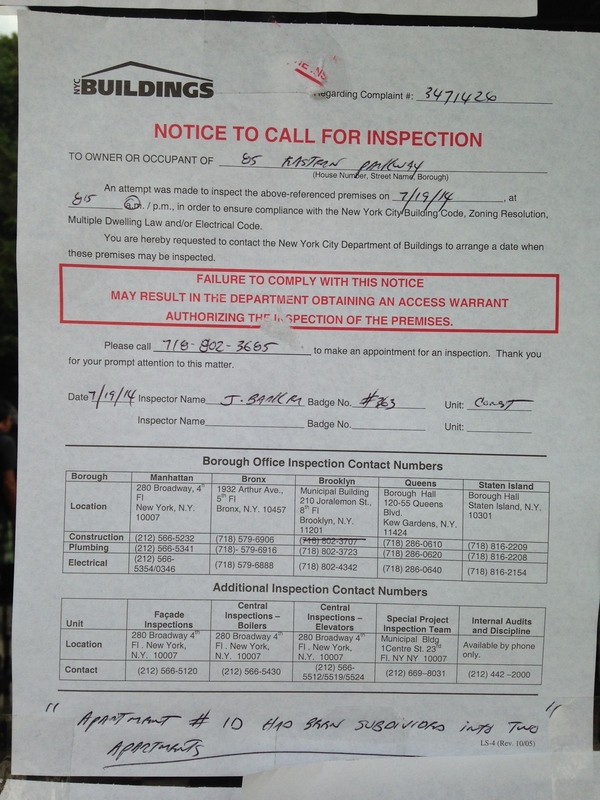 Latest attempt by the owner, Mordichai Nagel, to circumvent New York City codes and regulations in trying to eliminate rent stabilization in the building. 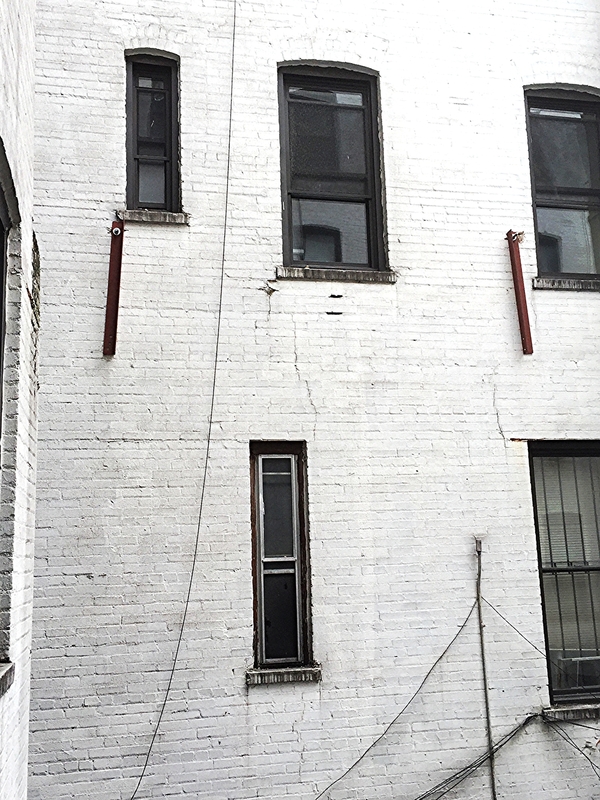 Photos show quickie fire escape being installed to try to circumvent Partial Vacate Order. Mr. Nagel's action is timed to take advantage of slow response by the Department of Buildings to other code violations. Note construction techniques used to anchor the fire escape in the facade of our 94 year-old building. 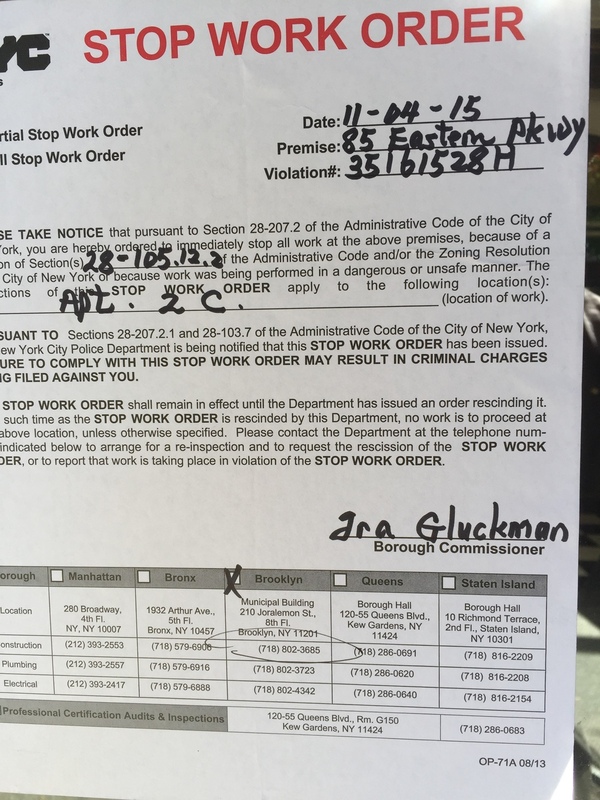 November 4, 2015 - The Department of Buildings posted on the front door of 85 Eastern Parkway two stop work orders, one for apartment 1D and one for apartment 2C. 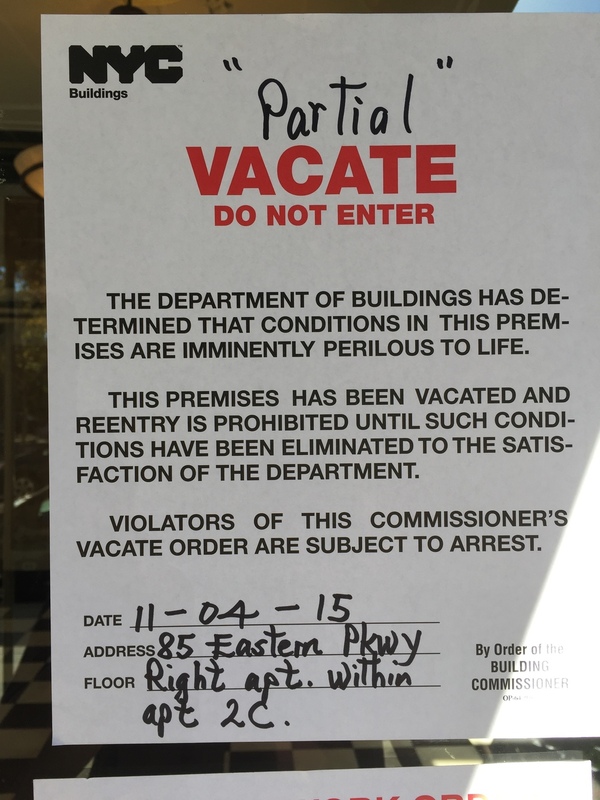 In addition the DOB also issued a "partial" vacate do not enter for Apartment 2C. The flyer states that "the Department of Buildings has determined that conditions in this premises are imminently perilous to life". Reentry is prohibited into that specific apartment. 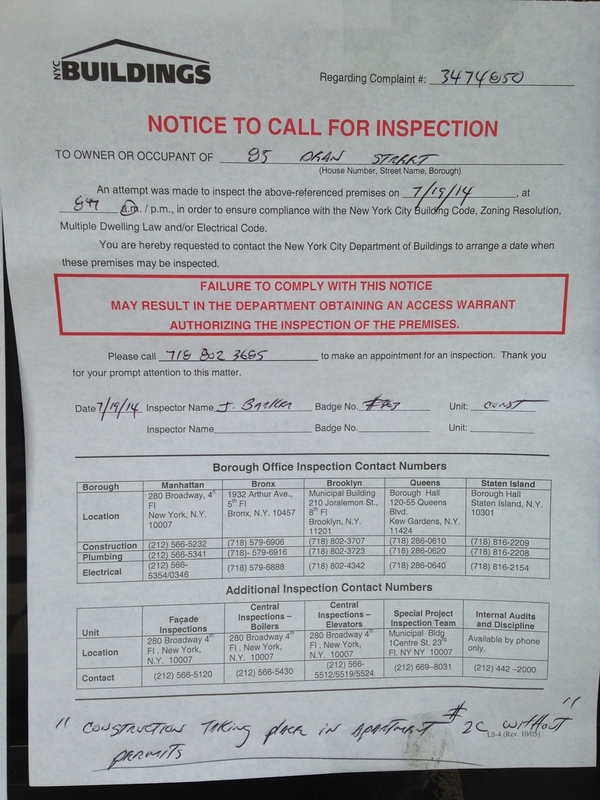 November 2015 - The miniaturization of apartments at 85 Eastern Parkway has continued and the owner wants " to add 7 additional units to existing residential building unit 1D, 1C, 2C, 3C, 4C, 5C, & 6C" as he indicated in the permit submitted to the Department of Buildings. Following an audit, the DOB has placed an Notice to Revoke on the job. The audit was based on false data submitted on the job application by the owner. Back at the beginning of 2014, long-time tenants moved out of rent-stabilized apartment 1D. Rather than rent it out again, advisors talked the owner into turning it into two miniature apartments. The concept they touted: claim rent stabilization was ended because the apartments are new, and charge a fortune in rent. That the kitchens are in the living room, and some of the bedrooms are barely eight feet wide was apparently not considered relevant. That was the idea, and so the owner spent a very tidy sum to gut the apartment, frame out two miniaturized apartments, and redo the plumbing. Then reality appeared: the architect didn't think out the plans, and a number of features won't pass inspection by the DOB [Department of Buildings]. At all. Six months later the apartment stands unfinished [and unrented]. The prospects for its future are equally dim, as some of the problems in the design [i.e. proper egress et al] have no obvious solution. And sitting in the wings are all the violations of the Multiple Dwelling Law that have yet to be cited. Hanging over everything is the basic legality of claiming that the space has been destabilized, an unresolved legal issue that begs years of litigation. 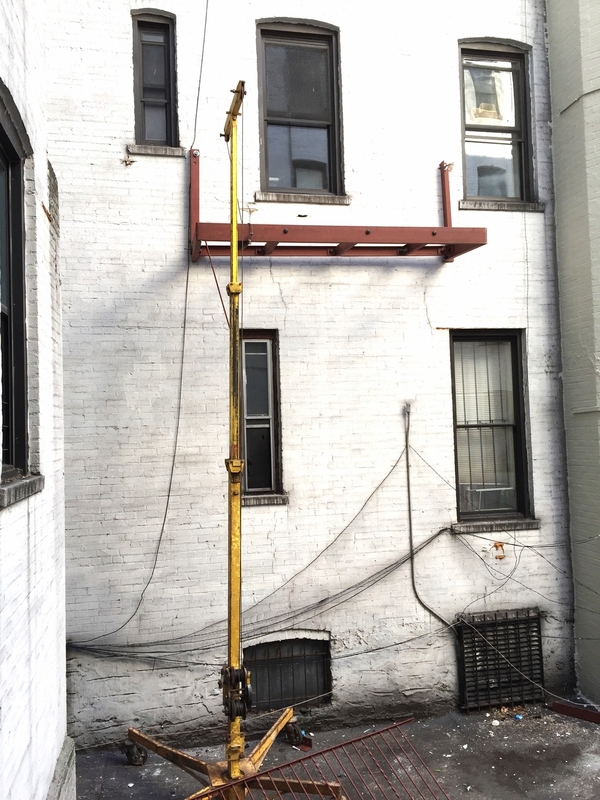 To add insult to injury, the architect and his contractor tried to cut corners with the DOB [permits and such], and as a result, have incurred two separate Stop Work orders, resulting in fines of $5000 each. In the meantime, 1D sits empty, the rent disappearing, month by month. The owner of The Martha Washington located at 85 Eastern Parkway, Mr. Mordichai Nagel, filed for a permit to build an additional 7 stories to the existing building. The architect for the project is Mr. Sandor Weiss from Gelu Durus Musica and the general contractor is David Mandel from Triple J&R Inc.
On July 25, 2014, our landlord officially withdrew his previously submitted plan to the NY Department of Buildings for the building of an additional seven floors of luxury apartments on top of our roof. This does not prevent him from filing a different proposal in the future, but it is good news for now for the residents of 85 Eastern Parkway and for our neighbors on the block too. The 85 Eastern Parkway Tenants Association wishes to thank all of those folks in the building who so far have rallied together to help protect where we live. It just goes to show that organizing around such a serious issue is worth the effort. The office of Laurie Cumbo, Council woman for the 35th district, for listening and writing to the NYC Department of Buildings about our concerns. Soil boring by Independent Testing Laboratories Inc. Please find more on the NYC Building Department website. Boring testing done in the front of the building by Independent Testing Labs Inc. for the construction project at 85 Eastern Parkway. Four permits were approved by the Department of Transportation (DOT) for testing between 13 February and 12 March 2014.